This utility will extract events from your Google calendar (or Google Apps Calendar) and save the information in a spreadsheet - currently either Microsoft Excel (xls) or as Comma Separated Values (CVS). 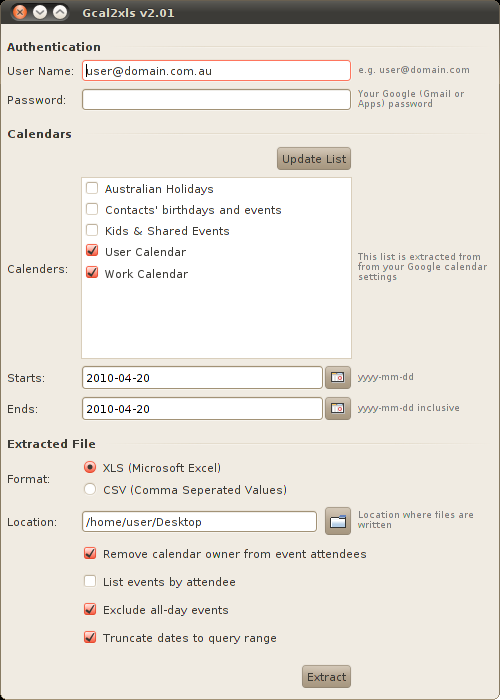 The original idea can from a Java utility called Gcal2excel. There are several references to this on the web, however I don't know who the original author was. I have used the same jars etc that the original author used, but I have completely rewritten it to to do the things I needed. Save in CVS format as well as Excel.